In Indiana, nursing home abuse is a societal issue that causes pain and suffering in thousands of residents’ lives every year. While federal and state laws are in place to provide sanctions for nursing home abuse, it seems that some nursing home entities believe that they are “above the law” and continue to exhibit patterns of abuse, neglect and exploitation of residents. 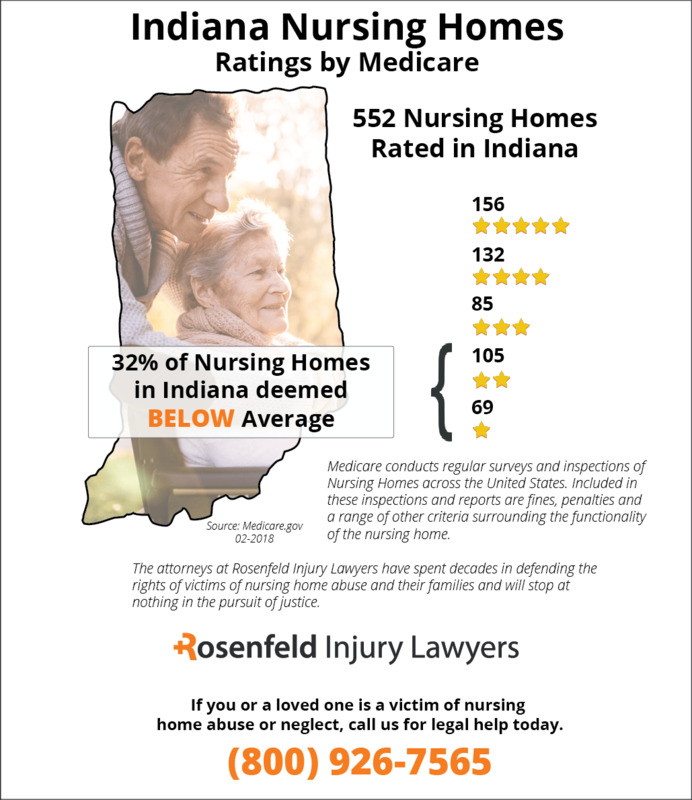 According to the data collected by Medicare, there are currently 552 nursing facilities rated in Indiana based on information gather through inspections, investigations and surveys. The federal agency found that 174 (32%) of these 552 Indiana nursing homes had serious violations and deficiencies. These facilities have fallen below the national average because they provide their residents substandard care that is lead to severe injuries or death. 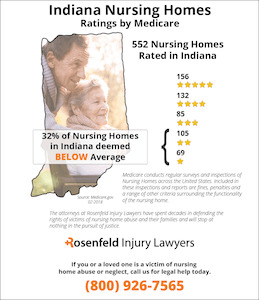 If your loved one was abused, neglected, mistreated or died unexpectedly while residing at an Indiana nursing facility, we invite you to contact Indiana nursing home abuse & neglect attorneys at the Nursing Home Law Center to discuss your claim for compensation during a free case evaluation. Research indicates that 44 percent of all facilities in Indiana have deficiencies that have caused actual harm in the lives of residents. In addition, over 58 percent of all Indiana nursing homes have an accident-prone environment that could pose serious issues to the safety of loved ones in such environments. Common accident-prone environments have issues like spills on the floor, broken equipment, improperly trained staff, lack of supervision, lack of safety devices and improper equipment for reducing the risk of falls. Family members should constantly be paying attention to the condition of a nursing home and treatment that a loved one receives. If family members notice that an Indiana nursing home begins to decline in maintaining equipment or sanitary conditions, then this could be an indication that a resident is the victim of neglect or abuse. Concerned family members can get in touch with nursing home abuse lawyers to learn more about the rights that loved ones may have. An Indiana nursing home negligence lawyer is available to investigate any potential claims of abuse or neglect that may be impacting your loved one. The Adult Protective Services Act is the governing authority of law that is intended to protect nursing home residents in Indiana. The law sets forth the specific procedure that one should initiate when it is believed that a resident is an “endangered adult” who is the victim of exploitation, abuse or neglect. The procedure requires that the witness file a complaint with law enforcement or another reporting agency, cooperate with the agency to obtain protective services for the endangered adult and comply with notification requirements. This Act maintains that nursing home workers have a legal duty to report an endangered adult when he or she has reason to believe that the adult is endangered. The individual who files a complaint in regards to a resident who is the victim of abuse, neglect or exploitation is also given immunity under the Adult Protective Services Act. The only individual who may not claim immunity is the one against whom the complaint is being filed. Family members and staff workers can also use a toll free report hotline in Indiana to report any incidents of abuse, neglect or exploitation. In Indiana, the toll free hotline to call is 1-(800)-992-6978. It is important that complaints of abuse be made as soon as possible to that an endangered adult can begin to receive protective services. Family members should be aware that nursing home residents are granted a broad scope of rights under federal laws. The Nursing Home Reform Act of 1987 provides numerous rights for residents, including the right to be free from chemical or physical restraints, right to be treated with dignity, right to receive basic necessities of life, right to use self-determination in medical procedures, right to be free from abuse and neglect, right to communicate freely with others, right to participate in development of a care plan, right to be fully informed of changes in a care plan and the right to privacy. Call an Indiana nursing home negligence lawyer to receive the assistance that you need to file a claim on behalf of the life of your loved one. While bedsores are common and persistent problems in nursing facilities, most can be prevented if the medical staff responds appropriately when a sore is detected. In fact, when the patient acquires any bedsore (decubitus ulcers; pressure ulcer; pressure sores) while at the facility, it can be an indicator of neglect. Because of that, families will often hire an Indiana bed sore attorney to take steps to stop the abuse, mistreatment or neglect immediately. Because the aging population in Indiana has risen significantly over the last few years, the need for nursing home beds has increased too. This is because many senior citizens living alone are often unable to perform daily activities without assistance, are recovering from surgery or have medical problems that require constant monitoring. 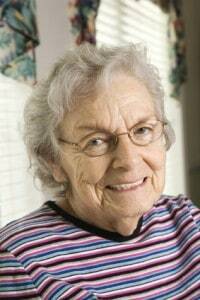 While living as resident of a nursing home, their health care is placed in the hands of professionals who hopefully are trained to provide basic needs, prescription medications and medical requirements. However, due to the demand for medical professionals in Indiana, the numbers of available registered nurses and nursing aides for hire are limited. Because of that, many nursing facilities are forced to hire unskilled and untrained caregiver, which often places the health of the resident at risk. As a result, the patient’s quality of life is often diminished and their exposure to developing serious health issues is increased. More than one in 10 Indiana nursing home residents will acquire a bedsore while living in the facility due to neglect, improper monitoring or mistreatment. A bedsore occurs when there is continuous pressure applied to a body part. The sores often occur on a bony area like the back of the head, shoulders, shoulder blades, spine, sacrum, buttocks, hips, knees, ankles and heels. When the pressure is not relieved after a couple of hours, the lack of blood flow restricts oxygen from reaching tissue, causing the skin permanent damage. Without immediate attention, the condition can become serious and cause the damaged area to ulcerate. Nursing home residents most highly susceptible to developing a sore are immobile or unable to reposition their body on their own, such as bedridden patients, or those bound to a wheelchair. If you suspect your loved one has acquired a bedsore while a resident in the nursing home, it is essential to seek legal counsel. A skilled Indiana bed sore lawyer can fight aggressively to ensure that the negligent stops immediately. The experienced attorneys below are knowledgeable in Indiana nursing home regulations and protocols for providing standards of care to your loved one. The law firm can help you determine if the pressure sore is the result of negligence. Their efforts often involve conducting a thorough investigation of the nursing facility and take appropriate steps to seek financial recompense for the damages and losses the family has endured. Fill and submit the form here to contact the reputable professionals listed below to schedule an appointment. The legal team at Nursing Home Law Center LLC will evaluate your negligence claim against the nursing home to stop the negligence and begin the process of building a case for compensation.